Sandra Day O'Connor was chosen by President Ronald Reagan on July 7, 1981 to be his first nominee to the Supreme Court and the first woman to ever serve on the Court. Prior to her nomination Justice O'Connor had served as a judge, legislator and executive branch employee in the State of Arizona. While nominated by a conservative President, she was considered a moderate during most of her tenure on the Court and upon her announced retirement in July 2005 she was touted as almost a liberal by Democrats in Congress (at least compared to the troglodytes they believed President Bush would nominate to replace her). She received much acclaim for her swing vote in Grutter v. Bollinger, 539 U.S. 306 (2003), that racial discrimination could continue in higher education admissions for another 25 years without violating the Constitution or federal discrimination laws. "Diversity," a state interest not mentioned in the Constitution was found so compelling as to overrule the Constitutional prohibition on racial discrimination and the equal opportunity laws. That decision and her support for abortion (Planned Parenthood v. Casey, 1992) and limitations on political campaign speech that enhanced the power of the media and incumbents (McConnell v. FEC, 2003) contributed to the media and Democratic Party favorable opinion of O'Connor in her final years on the Court. 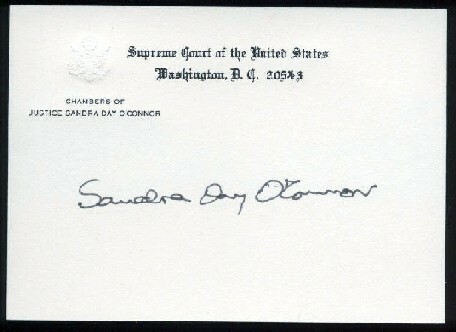 This card and her signature are in excellent condition and look better than the photo above.